This, along with mixtures containing ingredients such as asses’ milk to Dragon’s Blood, is just one of the many weird and wonderful medical recipes that you might discover if you join us for one of our Board Games and Medieval Medicines events. The games that we are playing are brand new and have been designed and developed as part of a public engagement project that the Museum has been working on in association with academic research in the history of medicine at the Institute for Oriental Studies, University of Oxford, funded by The Wellcome Trust. All the new games, which now include a card game, tile game, dice game and jigsaw have been inspired by the fascinating history of medicine and surgery being used in the medieval Islamic world and how this knowledge was recorded and communicated. 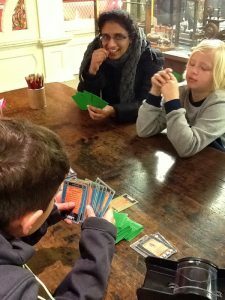 Over the past year we’ve been asking visitors to help us playtest our games at events in the Museum each month. This has definitely brought out the competitive side in some, with tensions running high as families compete to become a master scholar or superior pharmacist. Luckily only a few tears have been shed, and we think everyone’s left on friendly terms! Most importantly, these Sunday playtesting sessions have been slightly different to our usual family events. We’ve been listening carefully to the feedback and observing any stumbling points in the game mechanics. As a result, over the course of 12 months we’ve been making adaptations to the game rules and design to incorporate the feedback received from our game testers. This has been a really important part of the process of developing the games and we’ve loved hearing everyone’s suggestions. We’ll be holding our final Sunday playtesting session on Sunday 24th September from 2pm to 4pm. The games will also be available to play at our House of Wisdom family event on Saturday 14th October along with a whole host of family friendly activities inspired by our collections from the Islamic World. **Disclaimer: all recipes mentioned in this post are historical, we don’t recommend that you try them at home!